In today’s IT scenario, applications are integrated with organization’s website. Mobile apps and business success depends upon how organizations provide resources to mobile users as well as their customers. To accomplish the above, organizations have to configure specific application on server, located either on their own premise or data centre on which such applications are hosted. Virtualization technology plays a vital to reduce the resource requirement and overall cost as well as meet business needs. 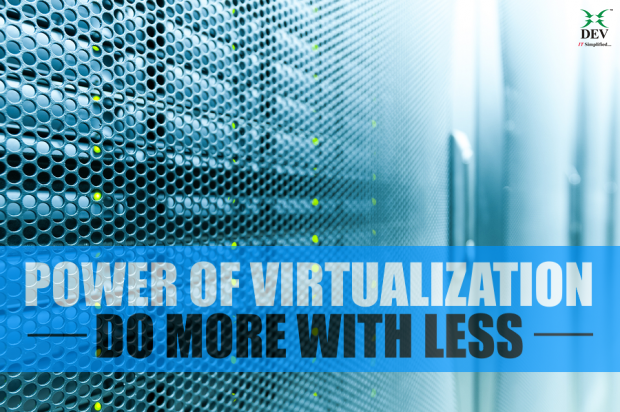 The power of virtualization is leveraged upon by organizations as well as Managed IT Services provider for their clients to achieve economies of scale. The applications and software in virtualization platform can be deployed and accessed in the same way as accessing any application hosted in physical server. That means virtual server exists, but actually as a guest operating system of host server. 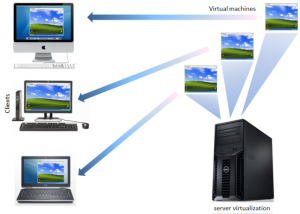 In computing science, virtualization means creating virtual hardware resources i.e. storage, CPU, memory, operating systems and network resources. The hardware and/or software virtualization means creating a virtual machine that acts as a real machine with an operating system. It contains resources called virtual resources which is separated from the hardware resources. Host Machine – It is the real machine which acts as a HOST of Virtual Machine and provides all required resources to virtual machines. Guest Machine – It is an operating system that acts as a real machines and configured on HOST machines. Virtual machine is a software computer that runs an operating system and applications on host server. It is a set of server specification and configuration files that resides on the physical resources of a host. Every virtual machine has virtual resource that provides the same functionality as physical hardware. Saves money, Save energy: Present servers utilize approximately 10-20% of available computing power. Furthermore, most of the organizations install only single application on each server. This increases an uncontrolled server growth and cost includes hardware cost, rack space and power. 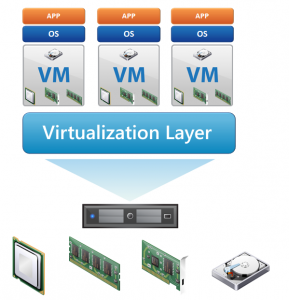 In Virtualization we don’t need to purchase dedicated hardware box for every single application. Hosting multiple virtual servers on a single physical machine, organizations can dramatically reduce their cost overheads. Reduce data center dependency: This means less networking, small number of racks needed, no need of data center floor space. Ease of system administration: All the virtualization technologies have management tools like “Virtual Machine Manager” that helps IT administrator to monitor and review the server performance. This types of applications notify the IT guys when any critical events trigger in server and virtual system. Ease of deploying the LAB or testing environment: New generation virtualization has feature to create server template/gold images that can be used to deploy new virtual server. We can also use cloning feature to deploy LAB environment for existing applications/servers setup. Resource optimization: We know the resource utilization fluctuates in each server through the day. For example, Exchange and SharePoint applications require more resources during the office peak hours and are mostly ideal in rest of the time, which means wasting the resource allocation. By considering the important applications/servers, we can allocate or transfer the hardware resources to another virtual server. 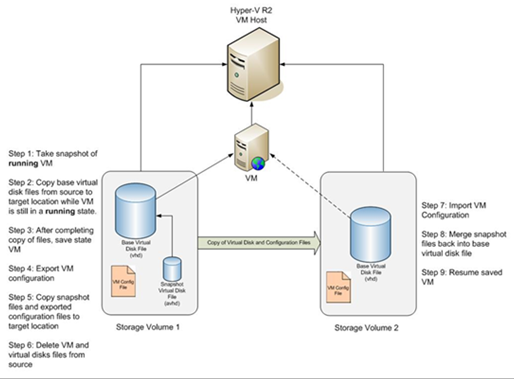 New generation virtualization tech such as SCVMM (System center Virtualization Machine Manager) automatically migrates the virtual server to another hardware to manage the resource utilization in HOST server. 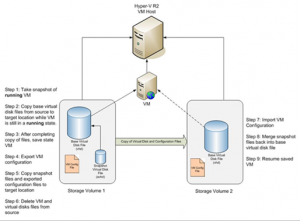 Ease of replication: Virtualization supports the virtual servers’ replication between the numerous HOSTs that sync their data with regular interval to make the copy up to date. It also verifies the data between source and destination at regular interval. In case discovering unhealthy status, it initiates the data sync process immediately to make it healthy status. Improves the disaster recovery: With the help of replication feature we can instantly perform the virtual server fail-over from faulty hardware to healthy hardware without considering the hardware specification. It also performs the server fail-over on different hardware which means we do not need to stick with identical hardware unless in specific situation i.e. an applications require specific hardware. Load balancing: It is not good sign to host all the virtual servers in single hardware that affects the hardware as well as guest operating system performance. 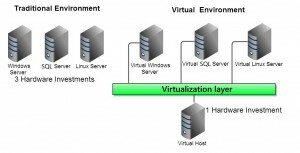 In virtualization, it is easy to balance the hardware load by distributing the virtual servers among the different hardware. Team Leader (Tech Support) at Dev Information Technology Ltd. I am energetic and enthusiastic IT professional in the IT service field having built up a strong base of service delivery, helpdesk management, system administration and team management. A very useful article. Worthy read…!!! Very well explained and the insite of Virtualization which is the need of time when everyone talk of Cloud and the underlining factor is Virtualization. Thanks you sharing such good article.